Nice to meet you all. 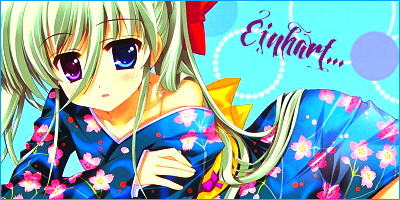 My name is Einhart, and I am new here. I was not able to find a thread or forum for introductions, so I made a new thread. I hope I did not cause any problems. Anyway, nice to meet you too. Its nice to meet you. I wish you a very nice stay here and a lot of fun. Hi there~ It's nice to meet you Ms. Einhart ! Thank you all for your warm welcome. I'd also recommend logging into the chat interface from time to time. We like to talk about very interesting things. Yes, very interesting....very, very....interesting. If you see me in chat, say "Hey!" Edit: *disclaimer* Sometimes I may seem like a complete douchebag or jackass, but I'm really a nice guy. 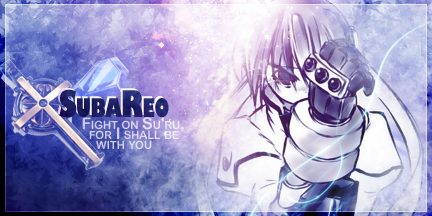 Edit 2: I like to edit things and change my avatar a lot. Avicii and Tiesto are amazing. Why I'm saying these things is beyond me, but yeah, it's chill. You already knew me but whatever, hi anyway. :3 Also first post! I hope you have fun in our site! I'm not really new and I probably should have worded that better. ._. Willkommen Frau Einhart! We hope you enjoy being a memeber of this awesome site! So, is this where the new kids introduce themselves? Um, hi. I'm Sneak Thief and I hope to get along with everyone. If you do anything on this website, at the very least, check out the StrikerS thread! You can help us bash such a terrific addition to the Nanoha universe (or speak for it; whatever suits your fancy)! So I found this thread and.. Thus I'm not very good at introductions, so- Please take care of me and pleased to meet you all. PS: Though I may not be online often, I'll try to visit this site more often. Thankies. Seriously, we hope that your stay here in NanoFate will be a good one. Ohhh lol, should I re-introduce myself? So many new faces and so many old ones left. I hope to get along well with everyone once more! Nagisaaaa! :3 Hai. You just rhymed. I found Magical Girl Lyrical Nanoha after i saw a Picture with Nanoha and Millhiore. And after i watched the 1st Season i became fan of this Anime. I hope we get along well. Thanks for having me, minna-san. I dont thought it would turn out this Awesome. Yeah I love Dog Days. Its a very good Anime in my Eyes and I am excited of Season 2. Come to the chat, Shinku. Nice to meet you, Shinku-san. Hehe, looks like my little thread has turned into the place for introductions. Nice to meet you as well, Einhart-san. I read that many others introduced themselves here, so i did same. There are currently 28 guests online.